Saracens Head Inn01600 890435work InnThe Saracens Head Inn is a seventeenth century riverside inn with ten en-suite rooms, most overlooking the River Wye and all non-smoking. We offer great value – enjoy our waterside terraces, bar, lounge and restaurant areas with real ale, fine food. Our Breakfasts are hearty and healthy and we have a resident’s lounge where you can relax and unwind. 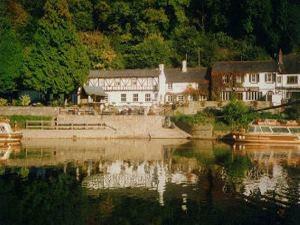 The Saracens Head nestles next to the River Wye, where it flows into a steep sided, wooded gorge at Symonds Yat East. Here you can unwind on our riverside terraces or drift across the tranquil waters of the Wye on our hand-operated rope ferry. Lunch or dine on freshly cooked dishes, using local produce wherever possible. Explore the many paths through the forest or along the Wye, on foot or by cycle, from our door. The Saracens Head Inn is a seventeenth century riverside inn with ten en-suite rooms, most overlooking the River Wye and all non-smoking. The Saracens Head Inn is undoubtedly an inn for all seasons but is particularly appealing during spring and autumn. Leave A40 (T) at South Herefordshire Motor Caravans in between Ross and Monmouth. Follow signs for Symonds Yat East for approx. three miles. Saracens Head cannot be missed.